I made an observation the other day, that then led me to another and then another. Perhaps these are entirely obvious to you but I hadn't previously made the connection between the tags I use, their frequency in my tagcloud and Chris Anderson's 'the Long Tail' theory. Doing a quick search on the web, I haven't found anything specific to this topic, so I thought I share what I found. As per the standard tagcloud visual representation, the size of each tag represents the relative frequency of the tags I've used - the larger the size of the tag, the more I have used that tag relative to another tag in my 'tagcloud'. Sized tagclouds can be a helpful navigational device, providing a view into the distribution of 'interest' about things. So if you look at my tagcloud, you can get a feel of what interests me. What I had a hunch about, and confirmed via the graphing, is that my interests seem to follow the classic Long Tail / powercurve. The most used used tag is 'RSS'. I've tagged 139 'articles' with the 'RSS' tag, around 36%. Each tag is listed along the horizontal axis and their frequency is represented along the vertical, so the tags most used are on the left ('RSS' tag starts the series). Lo and behold, athe Long Tail appears once more! This is more than a variation on the theme of the Long Tails of language (Zipf's observation that the frequency of words used in the English language followed a powerlaw distribution) and words - this is the Long Tail of my interests as represented by tags. I tag stuff of interest to me > my tags express my interests > the distribution of my tags express the distribution of my interests > My mind is a powerlaw! And if you tag a lot, yours probably is too...try it. Kind of obvious if you think about it, I suppose. But it hadn't occurred to me until I thought about tags in Long Tail terms. Let's take the Long Tail article published in Wired. 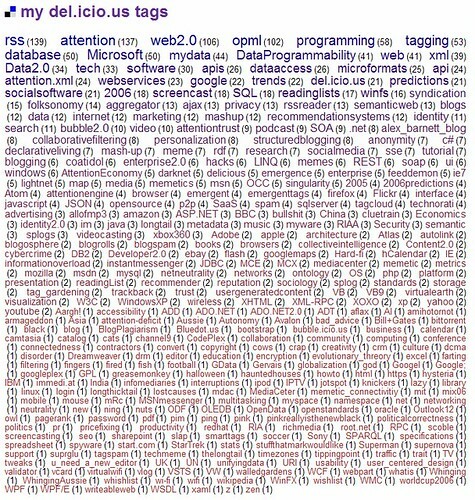 Around 1,500 users have bookmarked the article in del.icio.us using all sorts of tags. I looked for the number of tags used by all the users who tagged the article and see of there was a powerlaw there too. If there is a Long Tail here too, and I'm sure there is, what would that mean? And how do an item's tag distribution relate to behavior of their own tagclouds? We know already know in that the process of lots of people tagging stuff a collective agreement emerges about how things should be tagged. The popular tags used to categorize an article live at the 'head of the tail'. We can also assume the tags that appear in 'tail' of the Long Tail itself show how an article means different things to different people. But what of their relevance in terms of 'importance' to those taggers? So what does that mean? Again, this maybe quite obvious to you, but this seems pretty interesting. What it says to me at least is that these Long Tails of individual minds are strongly and potentially algorithmically correlated to the Long Tails of taggers' collective efforts. Looking at the tagging data in this way (and without any use of fancy algorithms) we can see the inherent potential of using tagging as a basis for collaborative filtering and recommendation systems. Based on the the simple and unscientific analysis I've done here, it appears that the world of tagging holds related Long Tail networks everywhere. This shows that there is a long tail of interest in every particular item. 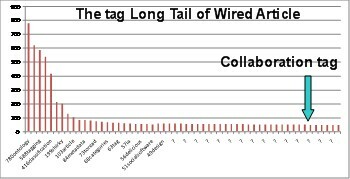 Most are interested in the Wired Long Tail article for "business" and "collaboration" but there is also a long tail of interest, that even stretches to collaboration. How should that effect marketing of products? A horror movie is typically marketed fans of the genre, actors, and director, but what about the long tail of people interested in the movie because of the location, the supporting actors, the extras, down to the costume designer, and best boy grip. This isn't theroy. I once saw a movie a had little interest in (that is, no interest in the genre, actors, or director) because my girlfriend was the assistant costume designer. Any recommendation system that is aware of the long tail of interests should tell me about all the other movies that she works on. There are only a dozen people who would see the movie for that reason, but it is enough to make it appear in the long tail. All creators need to make as much information about their products available as possible so that a long tail of interests aggregator can make it available to the right audience. Thanks so much for this analysis. My mind is brimming with ideas about this right now. This is a pretty interesting observation on your part Alex. Thanks for taking the time to explain it to us. Fascinating post on tags and how it applies to some of the concepts behind the Long Tail. Nice post Alex. I started on this a few months ago but never got as far as you did, I need to get back to this... very nice!